You may recognize this address as the Oakland Civic Auditorium. The stamp is at the end next to the museum. 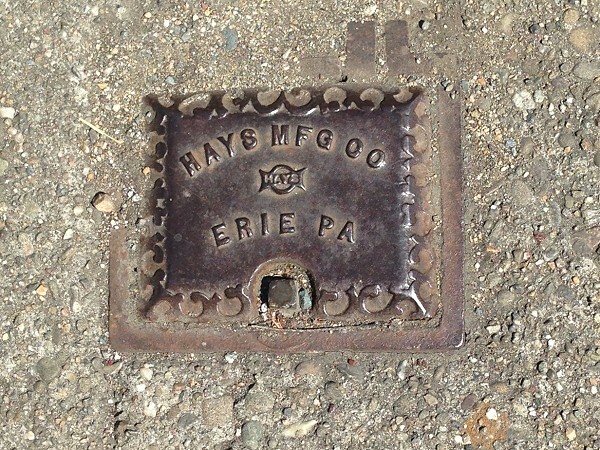 Here’s a roundup of some cute brass lids I’ve seen in our sidewalks. 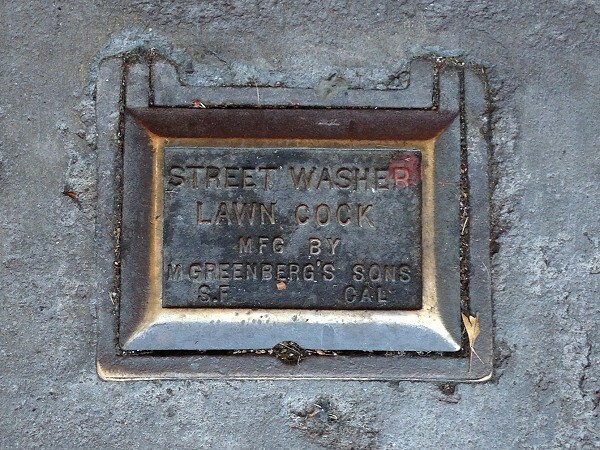 M. Greenberg’s Sons, the San Francisco firm I’ve mentioned before, made this lid next to the old Fairfax Theater building, out on Foothill at Belvedere. This pair of well-preserved covers made by the Hays company is on Piedmont Avenue. And this last one is from a company I haven’t featured here before. The Scott Company specialized in heating and ventilation systems, starting about 100 years ago. They were headquartered at 381 11th Street. I haven’t done a big search, but I do know they lasted until at least 1938. There was another Scott Company, in San Leandro, founded in 1975, that folded after a contracting scandal in San Francisco a few years ago, but that was not these guys. Then there’s this sidewalk maker. I haven’t been able to find out a thing about Mr. Nisalas. He must have been from outside Oakland. 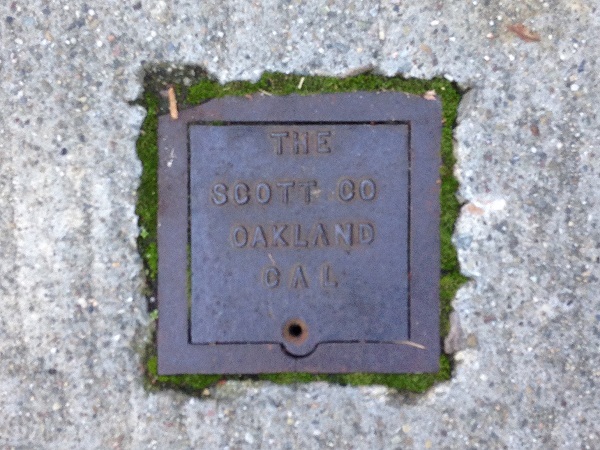 The sidewalks of Oakland were not paved with concrete until the late 1800s. Before that, pedestrians were shielded from the dust and mud of the roadside with gravel paths or timber boardwalks, at best. 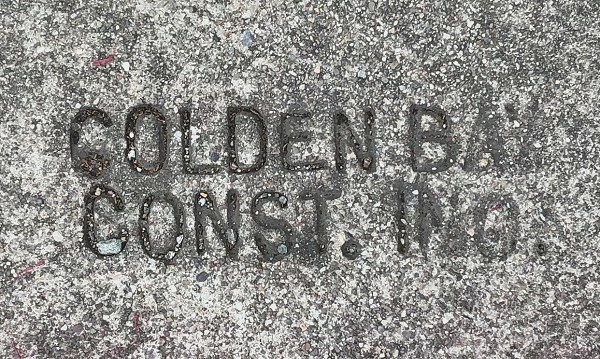 It was a point of pride in Oakland, regularly mentioned in promotional literature, when the sidewalks began to be widely paved. 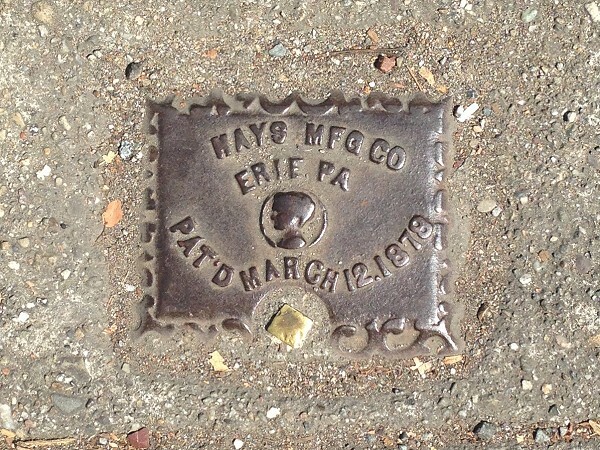 That stands for “Artificial Stone Paving,” the early term of art for sidewalk concrete. Starting in 1887, the San Francisco directories had a classified section for artificial stone manufacturers. It included George F. and Harry N. Gray, the notorious Gray Brothers, at 316 Montgomery Street. The Grays operated three quarries in the city at 26th and Douglass streets (Diamond Heights), 29th and Castro streets (Corona Heights) and Green and Sansome streets (Telegraph Hill). The same directory listed an Oakland firm, Oakland Artificial Stone Company, at 454 Ninth Street. If it ever produced sidewalks in this town, they do not survive. 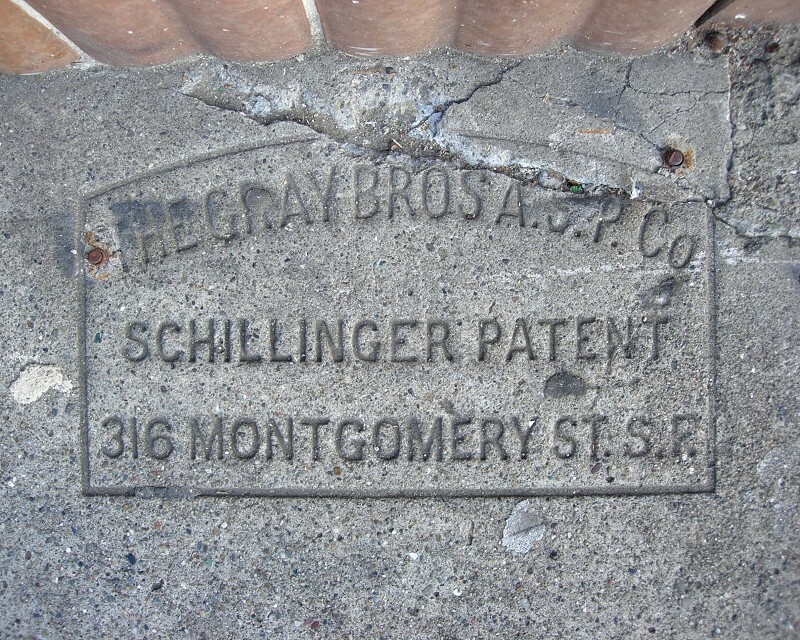 You may wonder about the “Schillinger Patent.” It was a method, patented by John J. Schillinger in 1870, of making pavements that involved inserting tarpaper or similar materials between blocks of concrete. No less a person than Frederick Law Olmsted made the name famous among Supreme Court scholars when he designed some concrete paving for the U.S. Capitol grounds, specifying a technique of this type, and took the chance that Schillinger’s patent wouldn’t stand up in court. Schillinger sued the government in the federal Court of Claims, and in 1894 the Supreme Court ruled in Schillinger v. United States that because the offense was merely a tort the claims court had no jurisdiction. 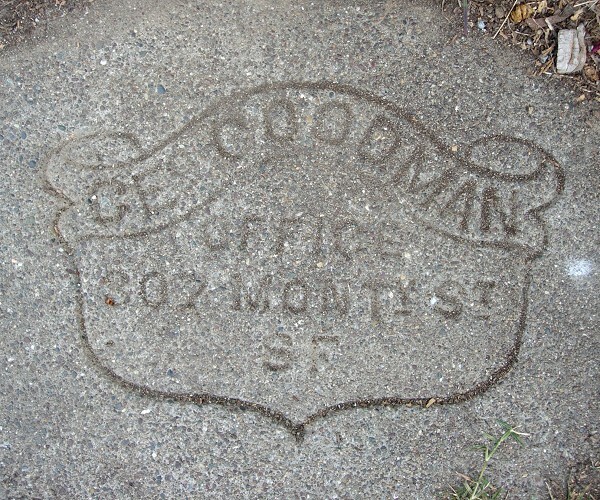 Another San Francisco artificial stone manufacturer, George Goodman, was listed in the 1893 directory as a Schillinger Patent specialist. One of his lovely marks survives here, at 1028 E. 17th Street. It’s a love that had no past. Over the last seven years and four months on this site, I’ve paraded about 2800 examples of sidewalk markings from throughout the city of Oakland. Each one included a name of some sort; most included a date of some sort. In selecting them I left at least ten times as many unremarked, either duplicates of what I had or truly anonymous marks. But every one was somebody’s contribution to our cityscape, expressing pride or ownership or just his or her existence here and now, once upon a time. This mark was the work of a moment, a gesture of something timeless impressed on the most durable canvas available. 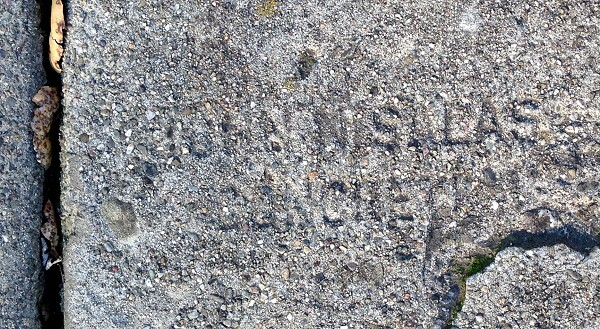 Not even concrete is permanent, but it’s sturdy enough to ferry a message some distance down the stream of time. Nearly nameless and without a date, this mark goes at the end of my great parade because some of the most important things are outside time. Like true love. Thanks for reading. From here on out, I’ll be putting up a new post every week. Sometimes there will be new marks to document, but I have a lot of other interesting material. I feel safe in saying this is the only mark by G. Vander Dussen existing in Oakland. This may be George Vander Dussen, who is recorded at age 11 in the 1940 census, living in Oakland’s council district 5 at the time. Oakland has a couple dozen marks by Jay Holt. I’ve featured two of them previously, the second cleaner than the first. This third one is pretty much pristine, showing the phone number LO 2-3369. I can’t find out anything about him. There are only two of these in all of Oakland. This is by far the best. The other one includes all the historical info I’ve gathered on it so far.